1841 Entire from Alderton to Tewkesbury showing manuscript Missent to HEREFORD. 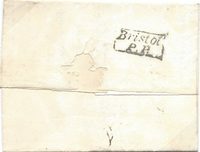 1814 Cover to Bristol showing a BERKELEY/119 mileage, GL 34, and a fine DURSLEY/Penny Post, GL 299. 1845 1d Pink Envelope to Newnham showing a very fine NAILSWORTH (under Stroud) Undated Circle. 1851 1d Pink Envelope addressed to Cheltenham showing a very fine CHARLTON-KINGS (under Cheltenham) Undated Circle in Blue. 1847 Cover to High Wycombe showing a very fine GLOUCESTER/N0 27/1847/3 SKELETON DATESTAMP, GL 394. 1859 Entire franked by two 1d Rose-Red, SG 40, tied by London "18" numerals addressed to Cheltenham and corrected to Bath showing on the front a very fine "MISSENT-TO/CHELTENHAM", GL 186 - Listed as GPO only. 1831 Cover from Devizes to Bourton on the Water showing on the front a fine oval framed MISSENT . TO . GLOCESTER. 1690 Entire from "COBERLY" (COBERLEY, GLOS) addressed "To John Newton Esq att ye flying horse an haberdasher's in ffleet street London" showing a very fine Bishop mark for FE/20 in black. 1884 3d Lilac, SG 191, lettered J-L. Very fine used with STROUD cds. 1832 Entire to Coleford, Gloucestershire, showing a framed "MISSENT TO/LONDON" in black. 1840 1d BLACK, SG 2, PLATE 1B, LETTERED M-F, DOUBLE LETTER 'M'. A SUPERB, LARGE FOUR-MARGIN EXAMPLE tied to Entire to Bourton on the Water by a very fine London Maltese Cross in Red. 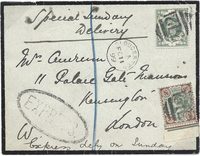 1856 1d Red-Brown, SG 29, tied to envelope to London by a very fine Type II CIRENCESTER Sideways duplex, Code D.